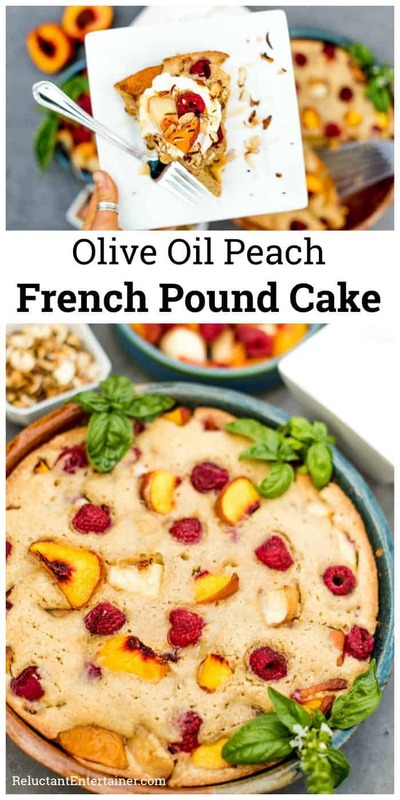 Olive Oil Peach French Pound Cake made with fresh or canned peaches, perfect for an afternoon or morning treat. Good enough for dinner party dessert. Are you enjoying fresh peaches, Friends? We have about 6 on our countertop right now, ripe and ready to sink our teeth into. 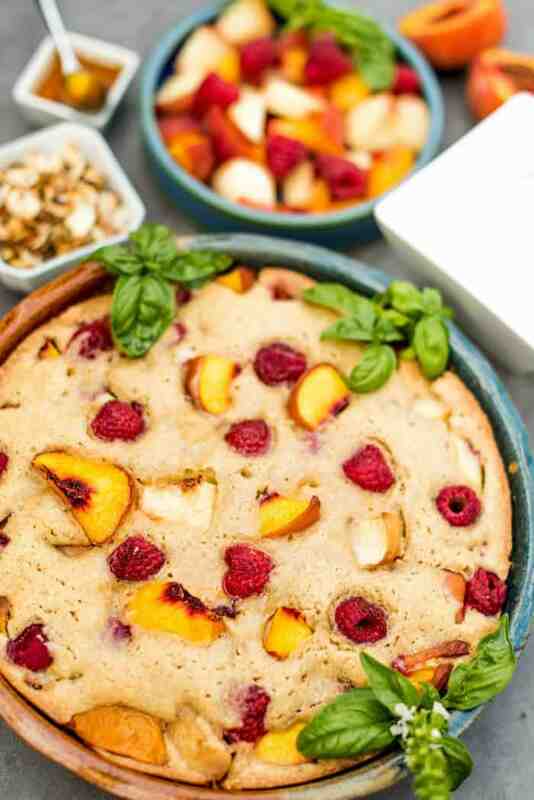 Last week we made this Olive Oil Peach French Pound Cake and WOW. It’s really good. 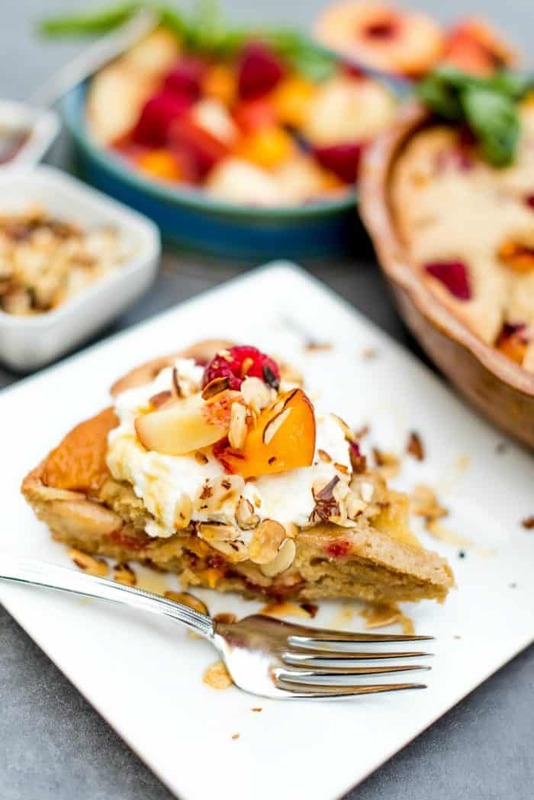 You may also love my Peach Kuchen Recipe or Peach Granola Crisp with Peach Cream. Here’s a little about myself and living situation. I live in a small mountain home with 3 introverts, 1 extrovert, and myself. Then there are the 2 dogs, whose personalities are 1 introvert, and 1 extrovert. So we are a crazy mix of personalities, and we have a lot of fun together. Oh, and I’m one of the extroverts. I’ve talked about writing a book about different personalties and hosting for years, but it’s a lot of work to write a book. (Check out my TAB for introvert/extrovert for more inspiration). Mixing personalities is sort of like a dance though, because in the morning, you have to figure out who wants to talk to who. When you have company over, there are the more outgoing individuals, who want to talk all the time, and then the ones you have to bring into the conversation, to make sure they are heard. You know what I mean. Being married to an introvert, over the years I’ve had to find a balance in entertaining that would not be draining for him. Because my kind of hosting would happen about 5 days a week! HA. So we’re good for drop-in company (because that is what hospitality is all about), but have determined to only host a dinner party about once a week. Introverts get their energy from within, while extroverts can go and go and go (the more external stimulation, the better). I find I’m in the middle now, in my middle 50’s, so in a way, Paul’s leaned in, and I’ve also leaned in, to find that perfect balance. Paul’s stretched himself more and I’ve embraced my inner introvert, and we’ve figured out what works for us. Then there are our kids (1 extrovert and 2 introverts) that have learned a lot from watching their parents. By the way, I’m so glad that my kids have learned the art of hosting. They’ve had 20+ years to watch and learn. 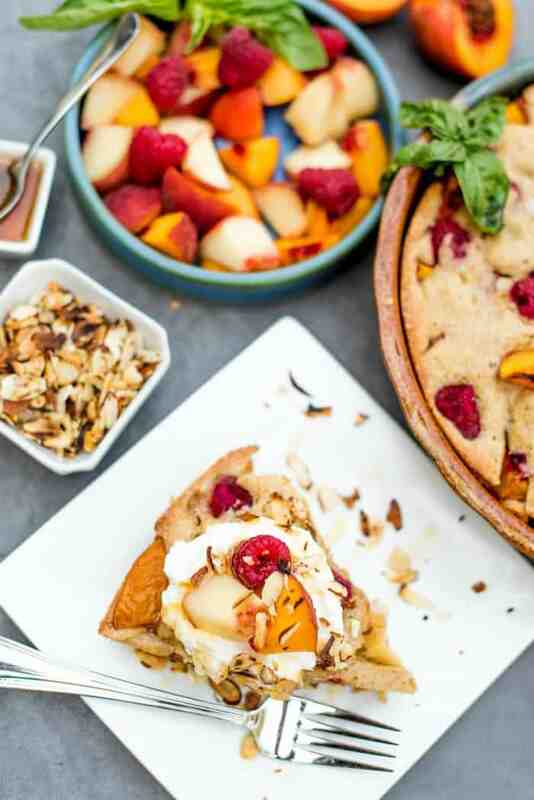 All this to say, this Olive Oil Peach French Pound Cake dessert today is a cozy one. It’s perfect for the cozy home, or pop in company, or to make for your family. The yogurt on top? Who would have thought? Oh, my. Oh, and serve it warm. 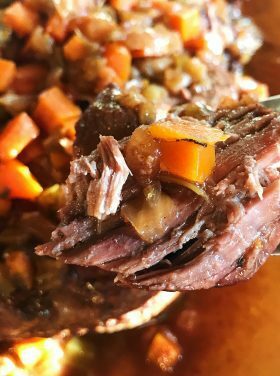 It’s cozy and delish! Preheat the oven to 350ºF. Butter and flour a 9-inch cake or tart pan. In a large bowl, separate the whites from the yolks and set aside. Next, measure the sugar, then remove a couple of tablespoons and set aside to add to the whites when you beat them. Set the remaining sugar aside. Measure out the all-purpose flour and transfer to a small bowl and set aside. 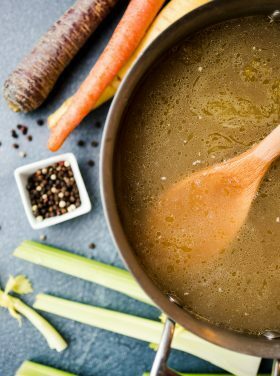 Finally, measure out the extra-virgin olive oil, place in mixing bowl, and begin beating with an electric mixer—adding in the sugar a few tablespoons at a time until it is fully dissolved. Beat on high for a couple of minutes, then add the egg yolks and continue beating. Add the flour into the oil about a quarter at a time. Mix in the vanilla extract, cinnamon, and allspice; mix to combine. Set mixture aside. Add a pinch of salt to the egg whites. 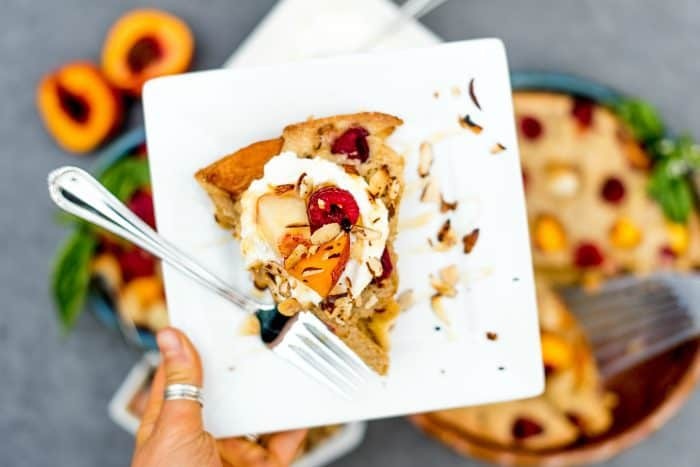 Begin beating with an electric mixer until stiff peaks form—adding in the few tablespoons of sugar to the whites throughout. Using a spatula, gently fold the egg whites into the oil batter until thoroughly combined. Lightly spread half the batter into the prepared pan. 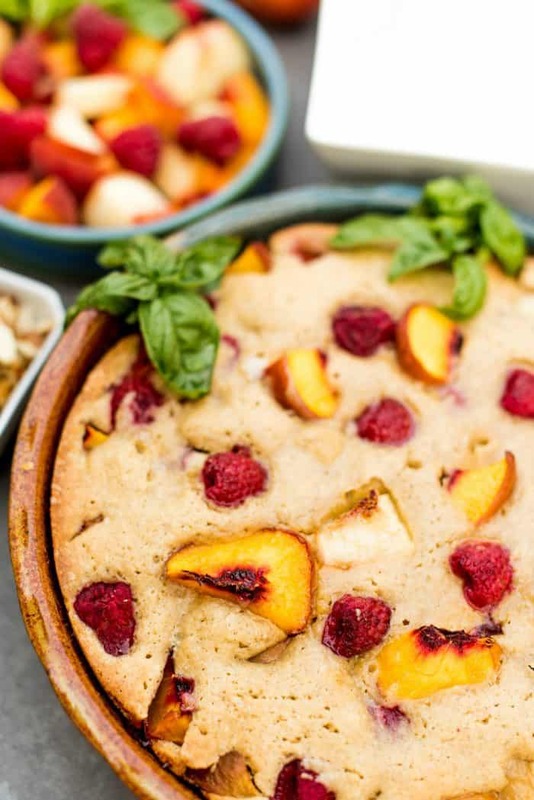 Sprinkle a bit more than half of the chopped fruit over the batter in the pan, then top with the remaining batter. Finally, spread the remaining fruit over the top and place in oven. Bake for about 45 minutes—until the top is golden brown and a toothpick comes out clean when inserted into the middle. 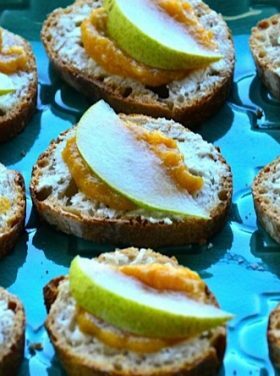 Serve warm or cold garnished with plain, full fat Greek yogurt (which adds an excellent tartness) and toasted sliced almonds. 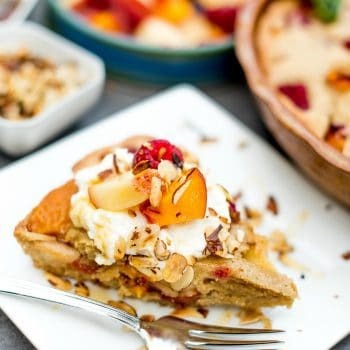 More peach cake recipes: Caramel Peach Dump Cake Recipe [Grandbaby Cakes], and Fresh Peach Cobbler Muffins Recipe [Barbara Bakes]. Breakfast Desserts Entertaining Hospitality Introvert/Extrovert Recipes Why Reluctant?